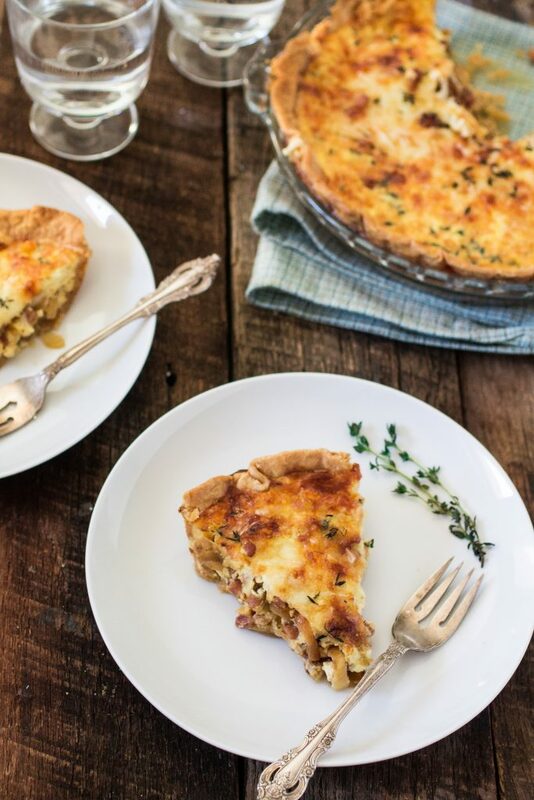 You will soon notice that I am beyond obsessed with this Ham and Cheese Quiche. I simply cannot stop eating it and I’m probably at my 3rd slice just today! I’m afraid Tim will get home from work and there will be none left… ? 1) Smoked Black Forest Ham. The highest quality, the best flavor! More on that later. 2) Full of cheese. Like, really! So much that I even considered making another one to shoot, thinking there was too much cheese in this one. Ha! C’mon, Olivia, there’s no such thing as too much cheese! It’s not like anyone EVER complained about a dish that was too cheesy. It is usually the other way around, and you definitely won’t have to worry about that here! Because CHEESE IS LIFE! ??? 3) Caramelized onions. Aaaand I rest my case! But back to the smoked ham, which, honestly, is the star of the show here! And not any smoked ham either. It is Boar’s Head SmokeMaster Beechwood Smoked™ Black Forest Ham, crafted with the finest ingredients and exceptional care. Naturally smoked with imported Germans beechwood, this ham has a delicious, distinct flavor that is both rich and smooth and pairs unbelievably well with cheese. Boar’s Head does all the hard work and all we have to do is eat the ham. Sounds good to me! Because you guys know me. There is NO WAY I will smoke anything at home! I’m all for making things from scratch, but when it’s something complicated and time consuming like smoking meats (or using lye to make pretzels), I prefer to leave it to the professionals. So, yeah… Thank you Boar’s Head for making this delicious smoked ham! I love you forever! You’re my best friend til the end of timezzzz! ?? You know who is not my friend, though? Pie crust hates me. If we were in high school, pie crust would not let me sit down at the cool kids table. It would make fun of me and demand I sit at the corner by myself and make everybody else laugh at me! Yes, that’s how I feel every time I fail at making pie crust. Sometimes I will be like “I got this! My dough is looking ah-mah-zing!”, dancing all around the apartment. And then I try to roll it and it falls apart on me, reminding me that no, we are not friends and I should not attempt to make it. Maybe I’m being a bit perfectionist, but oh how I would love to master this culinary challenge of mine. I told Tim I will from now on make one pie a week until I’m the pie dough master! Don’t get me wrong, the recipe I have for pie/quiche crust (that you can find here) is very good, flaky and tastes delicious. But I can never get it to look professional. The edges shrink and 9 times out of 10, it looks as if a child made it. Tim says it looks “homemade”. I can’t possibly decide if that’s a compliment or what. If you struggle with pie crust, like me, go ahead and buy the store bought stuff. Life is too short to be angry at pie dough! Or do make my homemade crust and let it look rustic. 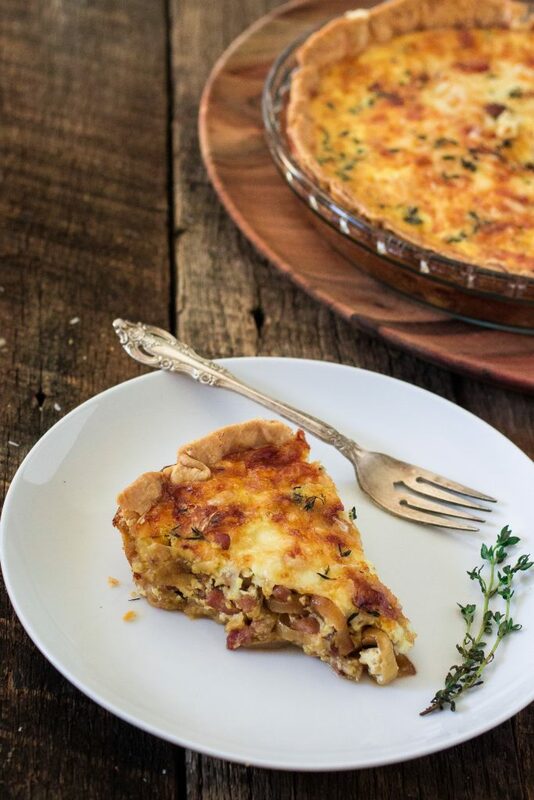 It will taste amazing no matter what and you will be wanting to make this quiche on a weekly basis. Also, if you’re a smoked ham lover, don’t forget to visit the Boar’s Head Smoke House Rules sweepstakes, and enter for a chance to win a gift card by sharing your own culinary rules for creating the perfect smoked recipes. Pre that your oven to 400 degrees. Line with the pastry. Fold the excess and use your fingers or a fork to shape the edges. Cut off a large square of parchment paper or aluminum foil and use it to line the pie. Snug the lining right up against the edges and sides of the pie. Remove the pie from the oven and remove the pie weights and the parchment paper or aluminum foil. Return the pie crust to the oven for 5 more minutes or until the bottom looks dry and the edges are golden. Remove from oven and reserve. Lower the oven's temperature to 350 degrees. Heat the butter in a sauté pan, over medium hight heat. Add the onions and sauté until they begin to brown, about 3 minutes. Then add the cubed ham and cook until browned, about 2 minutes. Reserve. In a medium sized bowl, whisk the eggs, yolks, half and half, salt, pepper and nutmeg. Scatter half the ham/onion mixture in the bottom of the pie crust. Layer 1/3 of the grated cheese on top of the ham. Then, add the remaining ham/onions and top with another third of the cheese. 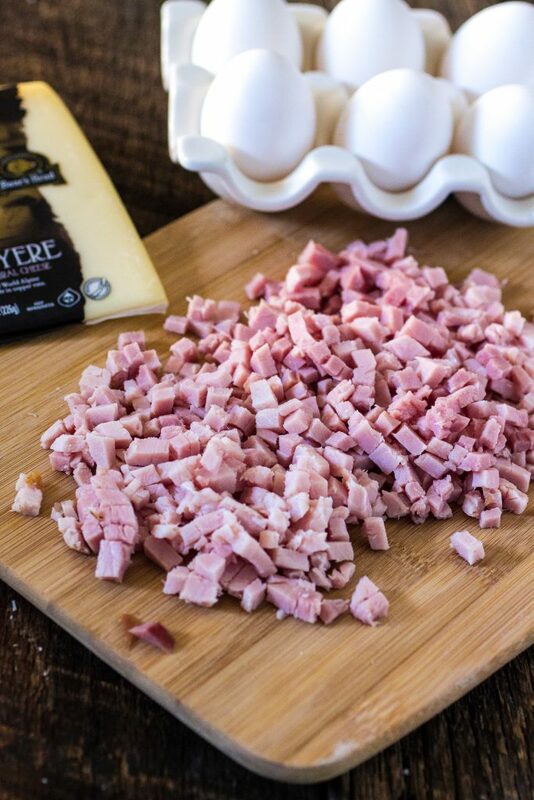 Slowly pour over the egg mixture and finish with the remaining cheese and the thyme. Bake for 45 minutes or until the filling has set and the top is golden brown. 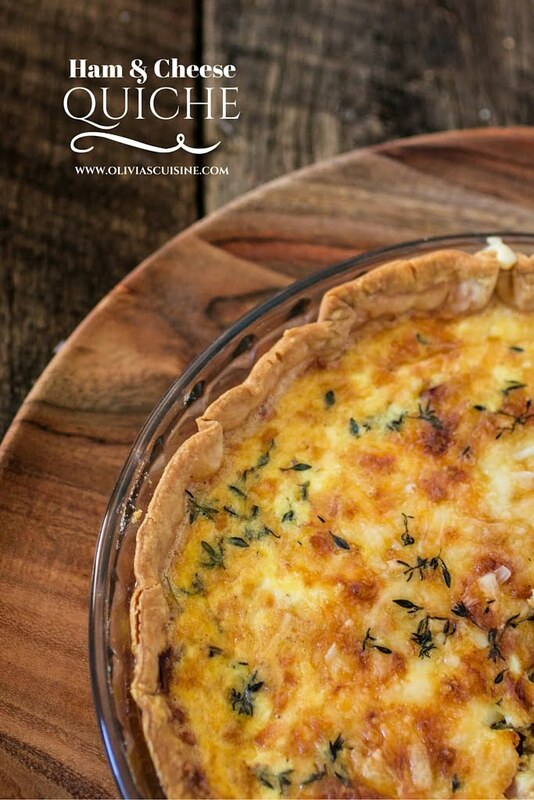 Cooked quiche can be refrigerated for up to three days. If freezing, bake first and then freeze. When ready to use, thaw overnight in the fridge and reheat it in oven. I can see how it would be challenging to smoke meat in NYC! Down here in the south we have big ole smokers and smoke meat all the time – although we have never done a ham. 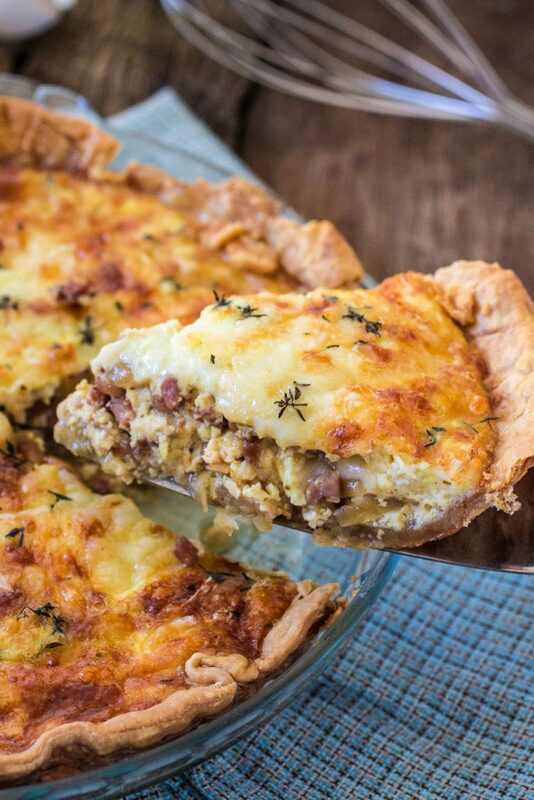 To heck with pretty pie dough – just call it rustic and make this quiche over and over because you can never have too much cheese and this looks fantastic! Love you choice of hero shot! 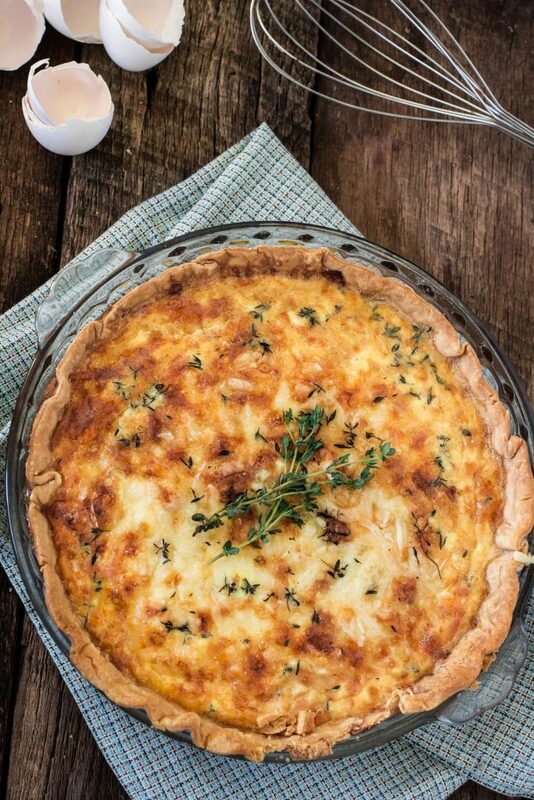 AND THIS QUICHE!